I never really got into the Dragon Warrior series. I missed my chance to try it on the NES, being very late to get into the RPG genre (Super Mario RPG being the first one I ever played.) The only official Dragon Warrior (well, it was Dragon Quest at that point) game I played was Dragon Quest VIII: Journey of the Cursed King, and to be fair, I only rented it because it came with a demo for Final Fantasy XII. How curious then that the first Dragon Quest game that I’ve actually gotten into would be a Dynasty Warriors spin-off. Dragon Quest Heroes offers a fun hack-and-slash game with RPG fundamentals that make it feel more like an entry into the Dragon Quest franchise than a Dynasty Warriors game with a coat of Dragon Quest paint slapped on it. Dragon Quest Heroes takes place in the land of Arba where humans and monsters live peacefully together. On the day of their festival celebrating this union, an evil wizard uses dark magic to turn the hearts of monsters against the humans and they begin terrorizing the lands. Luckily, the two plucky heroes, and captains of the Royal Guard, are on hand when this happens and it’s up to them to begin taking back the land and discover the source of the unprompted attack. Not unlike Hyrule Warriors, along the way familiar characters from previous Dragon Quest games begin showing up, confused by their sudden emergence in this new world. They band together with our main characters to put a stop to the madness and figure out how to get home. The player can choose between either of the two main characters: Aurora and Luceus. While Luceus is a master tactician, constantly coming up with long-winded, incredibly complex strategies, Aurora is a tomboyish, headstrong girl who likes to slash first and ask questions later. Both characters are built exactly the same in terms of attacks, and the only notable difference between them is while Aurora uses ice magic, Luceus uses fire. While Dragon Quest Heroes does feel very similar to almost every other Dynasty Warriors game, there are a few small differences that I really enjoy about it. For starters, the game wears its RPG inspiration on its sleeve, operating under a lot of RPG logic. Rather than populating a large battlefield with heroes to fight off the swarms of enemies, disconnected from each other, players build a team of four (Aurora or Luceus, depending on who you chose, always included) that work together and stay in a group throughout the fight. Players can also switch between each character on-the-fly, adding for a lot of interesting versatility in controlling the fight through each character’s unique style. The other interesting mechanic in Dragon Quest Heroes is the “monster medal” system, wherein upon killing monsters you get a chance to spawn a medallion which allows you to summon a monster onto the battlefield to help you fight or hold a certain position. These medals come in two flavours: gold for monsters who will fight by your side, or silver for single-use monster attacks. While it was an interesting mechanic, for too many missions it felt like “defend the thing” was the theme and getting monsters to hold positions in front of said thing while the enemies flank you became repetitive and annoying. This is particularly because you can’t separate from your group. Trying to manage a group of endlessly-spawning monsters while your summoned monster tries to take on two other groups of endlessly-spawning monsters becomes a herculean task. While several of these missions I had to replay once after failing to protect the thing, it was never so annoying that I wasn’t having fun. 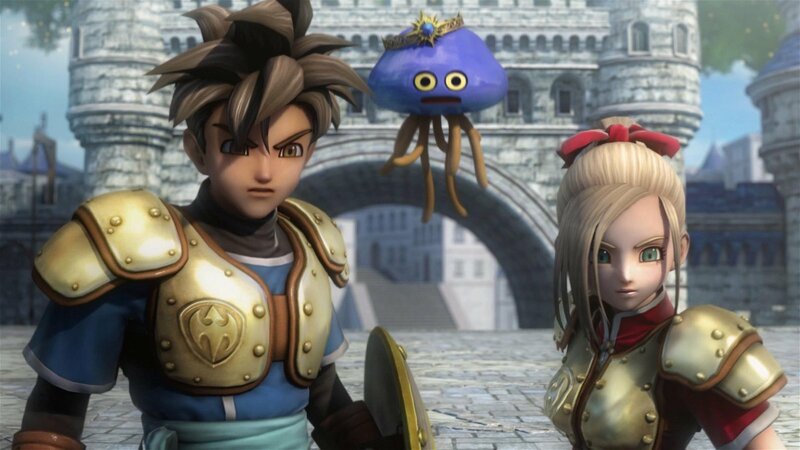 Dragon’s Quest Heroes looks beautiful, albeit a little strange. The character models are polished and have that distinctive Akira Toriyama style. Although, I will say it did feel a bit strange seeing the cel-shaded, anime-style characters amidst realistic backgrounds and environments. I couldn’t help but feel like the art style should’ve committed to one look, either realistic or cartoony. However, the cutscenes are where the game earns real style points, often playing out like really good anime. They’re silly, funny, and have a lot of charm and I found myself praying for a cutscenes at the start or finish of every mission. Much like Hyrule Warriors, the music selection, I’m guessing, takes the classic Dragon Quest themes and mixes them into an upbeat and intense fusion of rock and orchestral, creating the perfect balance for a game like this; orchestrated themes to fit the fantasy setting, hard rock to capture the intensity of the combat. The voice acting is superb in both the English (and I mean UK English, which I believe is the English option for most of the Dragon Quest games) and the Japanese. In fact, I would highly recommend playing the game in Japanese as it lends itself much better to the anime-style cutscenes. Overall, I had a lot of fun with Dragon Quest Heroes. It feels like a simple distraction, but it actually has quite a bit of depth. 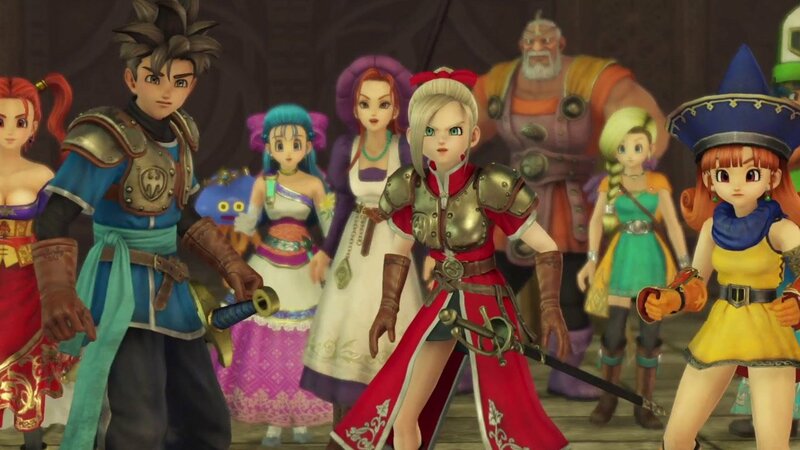 Fans of the Dragon Quest franchise will undoubtedly enjoy it and it certainly feels like a game for the fans; containing multiple characters from several Dragon Quest games. 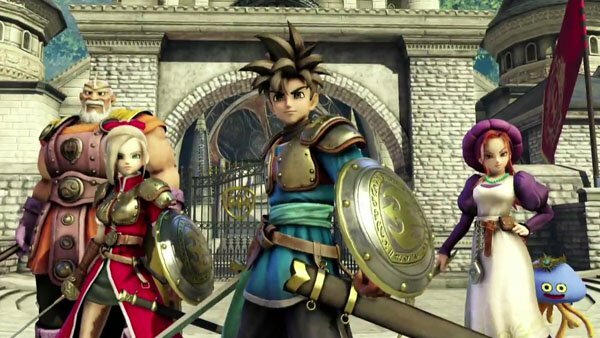 However, if you’re like me and new to the series, Dragon Quest Heroes might also pique your interest for other entries in the franchise. Dragon Quest Heroes feels like a simple distraction, but it actually has quite a bit of depth.